Canon's LASER CLASS 730i Internet Facsimile System offers you the flexibility and productivity you are looking for in a multifunctional office solution. The best part is the LASER CLASS 730i comes standard with Internet Fax. Internet enabled fax machines allow the user to convert scanned documents into file formats that are easily transported over the Internet or the company intranet. With the help of push scan technology, internet fax allows users to send data to E-mail address destinations, other I-fax-capable machines, network or host folders and files, and to document management systems. Internet Faxing bypasses the public switched telephone network and allows users to send scanned documents over the Internet as E-Mail attachments using the customer's established data network infrastructure to carry information. It offers many advantages, such as, the simultaneous and instantaneous distribution of information, maintains document and image quality, increases productivity, and it is virtually free! The LASER CLASS 730i also comes standard with Standalone Faxing, Local Printing, Network Printing, Network Faxing, Network Scanning, and Convenience Copying. Internet Fax! 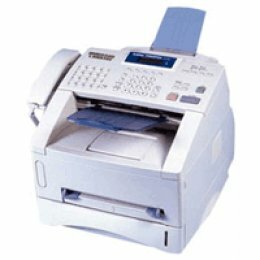 The LASER CLASS 730i ships standard with Internet Fax capabilities. This allows users to send faxes to E-Mail inboxes, receive E-Mail from a fax machine, convert paper documents into digital files, and take advantage of network printing and scanning capabilities. High Speed, High Quality Output is standard on the LASER CLASS 700 Series. Documents are printed at a fast 19-ppm, even when printing at 1200-dpi. Canon\'s Ultra High Quality (UHQ) is able to distinguish graphics from text on outgoing documents in order to deliver maximum image quality with every transmission. Super G3 Technology featuring JBIG compression significantly reduces phone line charges by transmitting data at 33.6 Kbps, 35-scans-per-minute document scanning or 1.1 seconds per page, and saves time and money while increasing fax productivity. High Volume Paper Capacities. The LASER CLASS 730i comes standard with a paper supply of 600 sheets: two 250-sheet front-loading adjustable cassettes and a 100-sheet multi-purpose tray, with the option of an additional 500-sheet letter-sized cassette. Memory: The LASER CLASS 730i ships standard with a large memory of up to 1,500 pages (40MB).